This public area is for Pause’s customers in doing activities, breakfast, and barbecue. Breakfast, a la carte menu, appetizers, soft drinks and mixer will also be provided at PAUSE Bar as well. In addition, our bar has never ever lack of music, you can enjoy music and live band while drinking and chilling every night. 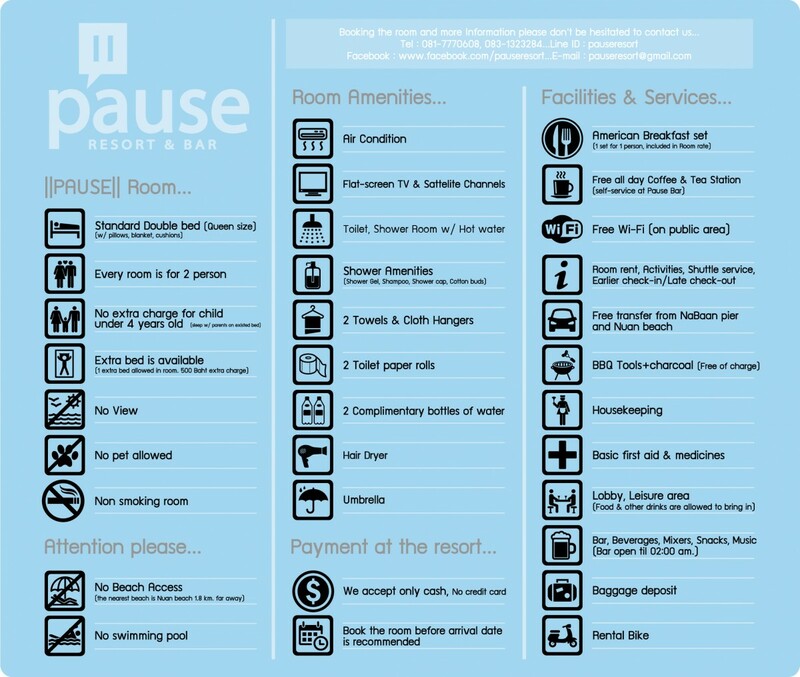 We welcome all clients including customers who are not staying at PAUSE Resort as well. Open daily from 18: 00-02: 00 hrs. Closed on every Tuesday. We serve American Breakfast set every morning from 08: 00-10: 30. Self-service & Available all day for FREE at PAUSE bar area. PAUSE resort offers “FREE” BBQ accessories (1 bag of Charcoal included) for customers who stay at the resort. Extra charge is required for non-resort customer. Motorbike rental with full of petrol. Fees >> Overnight rate 300-500 baht / bike / night. Daily rate (rent on the morning and return before 17:00 hrs.) 200-300 baht / bike / day. Available at Pause bar, please check password with PAUSE staff. Medicine for diarrhea, indigestion, headache, stomachache, food allergy, repellent, wound dressing equipment, etc. can request from our staff.